This enticing new collection of Kontakt-based instruments is a bundled assortment from the mind of sample creator and media composer Pendle Poucher, and his unique company, Sound Dust. Despite their availability elsewhere, there is something quite complementary about the five included instruments, so let’s dive right in. 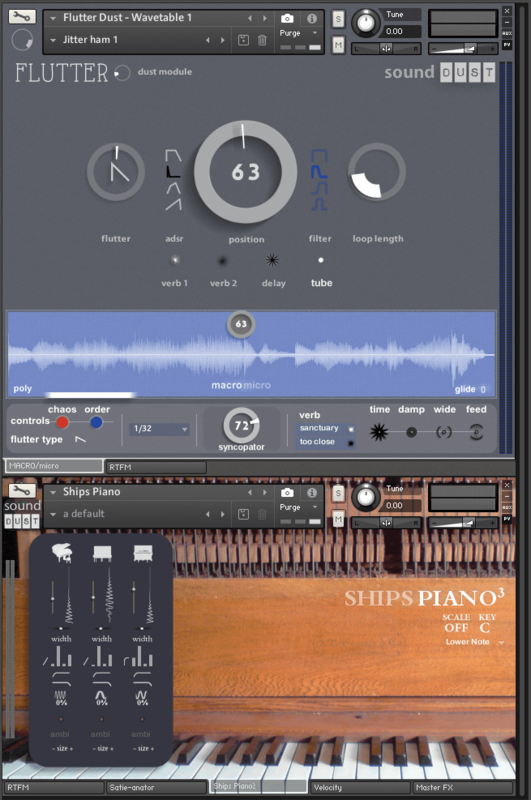 Probably the most simplistic of the included instruments is the Ships Piano3, which offers pianos in three forms, ripe for layering. These include a ship’s piano, a school-hall-styled grand piano, and an upright, which has been altered to a considerable degree in various guises. While the ship’s piano is subtle and felt-esque, the grand has been recorded binaurally within a school chapel, with sample layering that offers sharp staccatos when playing with less velocity, and longer tones when playing harder. Meanwhile, the upright is not so much a prepared piano as a set of prepared samples which have been effected with envelopes, filters and reverbs. The resulting sum of parts is subtle, detuned and seriously beguiling, and a perfect addition to a set of more perfect piano libraries. Alongside the basic tonal construct, you’ll also find the Satie-anator, which is a form of trigger-based sequencer, driven by keyswitching in the lower octave of the keyboard. In use, Ships Piano3 oozes bespoke quality and hints of randomness, which help make this highly individual and truly inspiring to use. Pendleonium3 offers another very playable instrument, which is based around the layering of six individual components, drawn from two Danelectro Baritone guitars, two Fernandez ‘infinite guitars’ and a spring viola, which has been fed through a Roland Space Echo to create endless pad-like effects. The Fernandez guitar samples extend for miles, thanks to the inclusion of Sustainiac pickups and built-in EBows. It’s very reminiscent of Twin Peaks, but with plenty of control to allow for ambience and octave placement. In use, and largely due to size constraints within Kontakt, this can all be a little bit fiddly to use, but it’s well worth persevering with, as the resulting tones can range from subtle to disturbing. 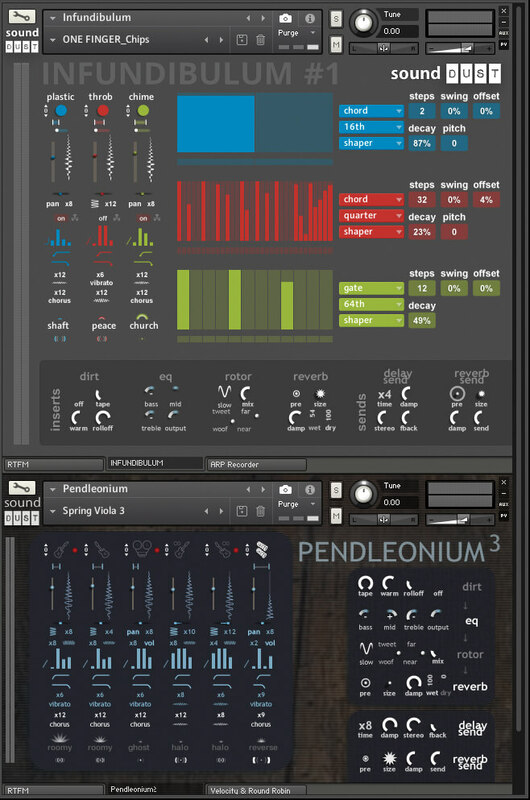 Infundibulum is a long-time favourite of mine, and possibly best described as a three-layer arpeggiator/sequencer with polyrhythmic capabilities. Each layer is equipped with a set of pure samples, which are sonically cohesive, but with variation across each layer. 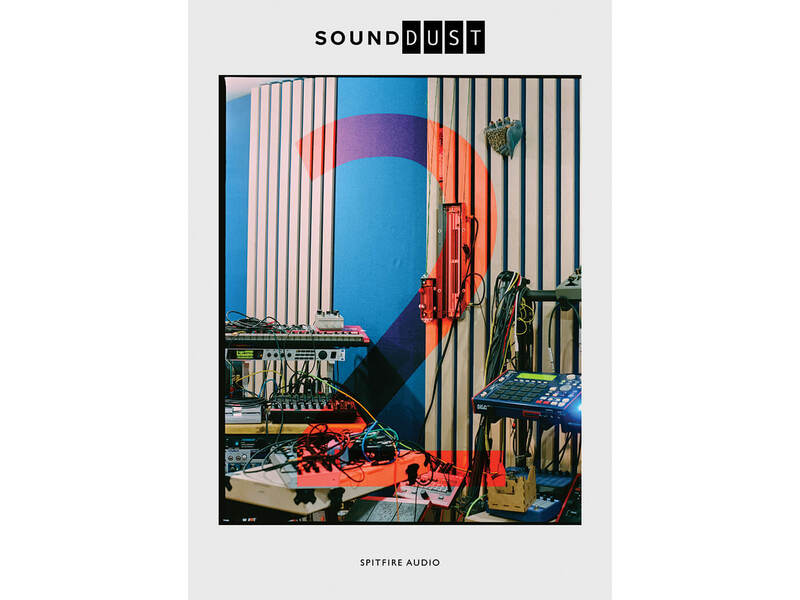 Samples include synths and acoustic strikes, such as dulcimer and Rhodes. Once timbral selection is made, the next option is to engage the sequencer element, which in turn triggers the sample in a number of ways, dictated through choice. Gates, chords and even ‘Über Wonk’ are all options, as the resulting set of triggers follows the curve of the volume histogram. It’s easy to change and tweak, allowing for each of the three layers to have its own trigger pattern and note value, meaning that cross-rhythms and textures can come and go easily and effectively. The results speak for themselves, as the output is sublimely beautiful and highly televisual. I’ve always liked that this can be used on numerous levels; as an addition to other elements in a track, or by engaging all three layers to make it a central component of a piece. Oddhop, on the other hand, is equipped with a more percussive sound bank, with sequential layers that can be programmed and triggered from the keyboard. 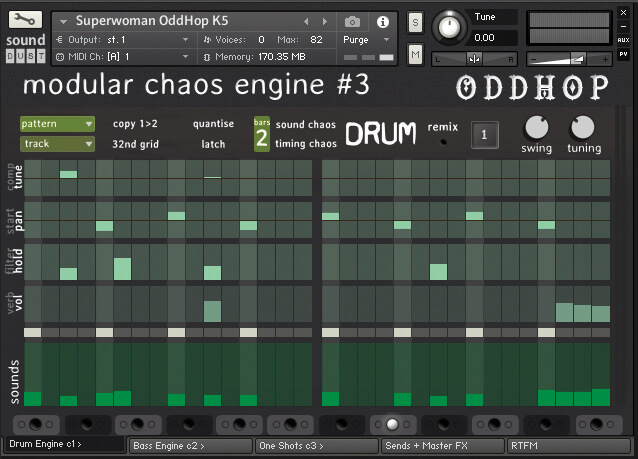 With two layers for both drum and bass programming, Oddhop is described as what might happen if you fused a Roland TB-303 with a TR-909, but then included a huge number of interesting and quirky samples. On the most basic level, Oddhop allows the step entry of notes on a 1- or 2-bar grid, ready for triggering as loops from the keyboard. Alongside this, single sample hits can be triggered separately, in the upper-key-zone area, but the real strength lies in the adaptation of the sequential element, which also allows for control of pitch, volume and panning, although timbre selection can be a little bit fiddly, as it is made in a similar histogram-style manner. it’s possible to trigger from within a different part of the bar, but always quantise to the nearest 16th note. By creating a number of patterns, all of which can be triggered individually, Oddhop can make up the quirkiest of backbones to a track, building effortlessly as one pass replaces the next. Add this to the single-trigger samples, and you’ve got the most interesting of tools. The final part of this compendium is the Flutter Dust. Billed as a 21st-century version of the Mellotron, it allows for the loading of a wavetable/sample, which can then be triggered and played from the keyboard. 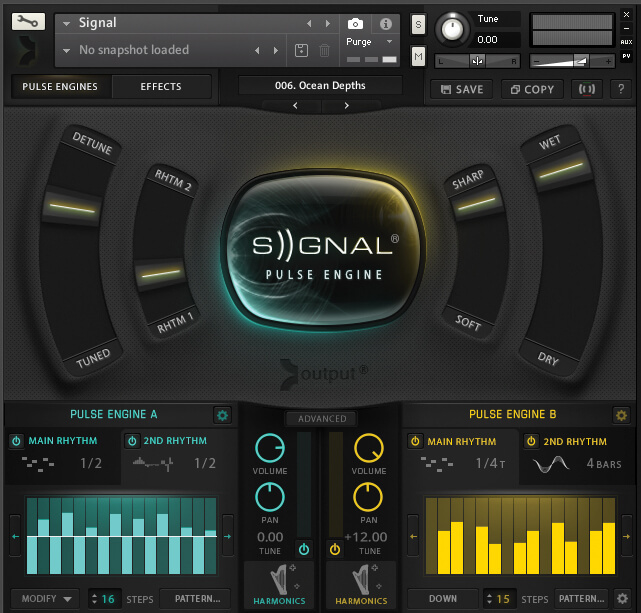 What adds further to this experience is the ability to loop and retrigger from any point in the sample, or specify on the individual note level which part of the wavetable might play. This means that chords become unbelievably interesting and full of intrigue and movement, complete with the ability to control filtering and gating on a per-note level. It offers complex pads, rhythmic pulses and oodles of control, all from a simple interface. It’s fair to say that this compendium of a package represents considerable value for money. The five included instruments really are excellent, but moreover, they’re all pretty unique and inspiring in their own ways, while still complementing each other brilliantly. Creatively, this package is something of a rabbit hole, as you could easily find yourself becoming lost for hours in this sonic world and find the most amazing textures, pulses and rhythms that will come easily and effortlessly. Granted, some of the interface elements are a little tricky to control, due to onscreen size and sheer volume of information, but the trade-off in this regard is the reward of some really interesting sounds. You’ll find plenty of highlights within this collection and with the bar set so high, nothing will disappoint. We all like instruments that inspire us creatively, especially if they invite the user in to change the sonic construct, and this package could be considered a real pinnacle in sound exploration. On a musical level, it has much to offer inspirationally, and will easily find common bedfellows with anyone needing interesting sounds across all genres of music. Soundtrack composers will love these, which is hardly a surprise given Pendle Poucher’s professional background, but it will also appeal to anyone who wants something more quirky and esoteric. There’s also tremendous variety, with the inclusion of both playable and sequenced instrumentation. It’s an enthralling product and one that should be considered and explored. 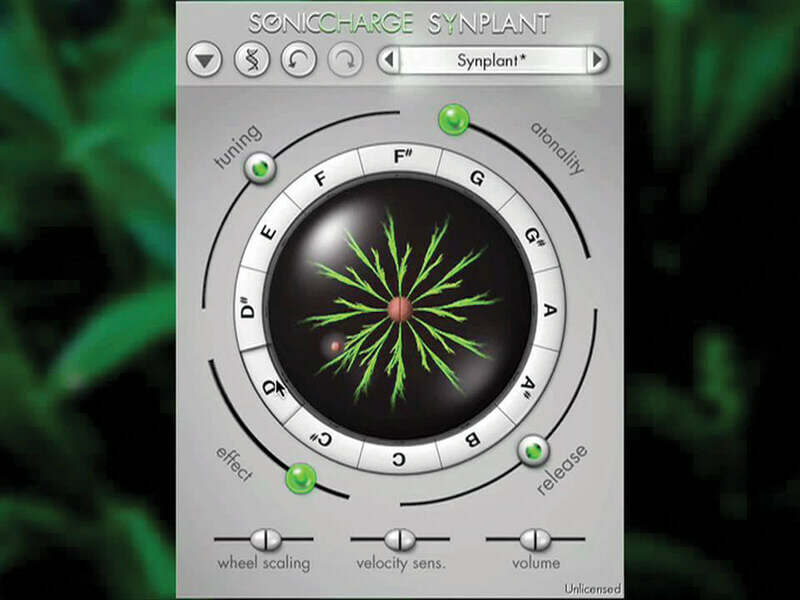 Another one of our esoteric favourites, the Synplant allows the user to plant a seed which grows into a synth patch. It’s the musical equivalent of building a genetic sequence! Creative, interesting and overtly esoteric. 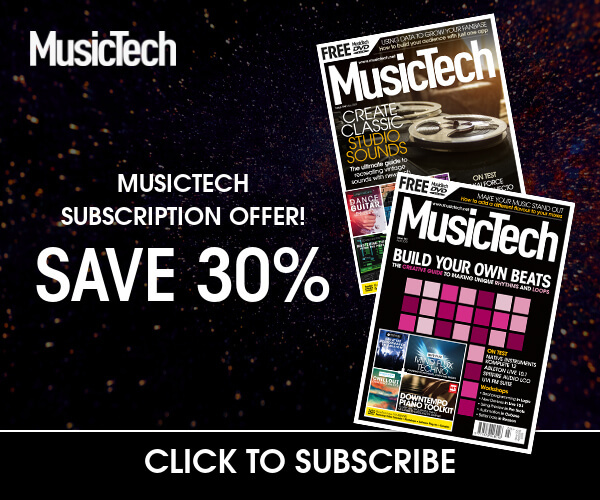 a wide variety of tasks, from EDM production to media scoring. 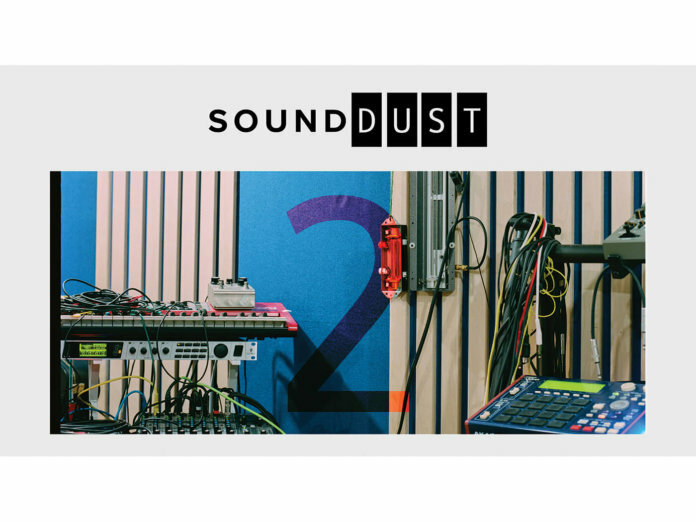 This is a sublime package which has been elegantly assembled by Spitfire, from the inspired mind of Sound Dust’s creator, Pendle Poucher.